Leechburg’s Video Club again participated in FBI Pittsburgh HOPE (Heroin Outreach and Prevention Education) PSA Contest, established to help bring awareness to the opioid epidemic. Students in grades 9-12 were invited to submit one-to-three-minute videos addressing the threat that opioid use poses to teenagers and the consequences of opioid use. 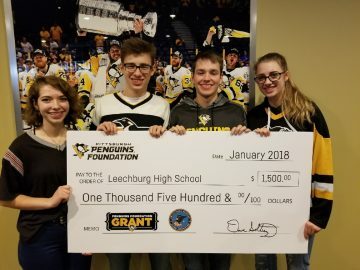 The club took second place in the People’s Choice category, winning home tickets to a Pittsburgh Penguins home game and $1,500 funding for the club. Videos in this category were chosen based on the number of likes and shares on social media. Students Trent Foster, Joseph Price, Alexis Price and Sophie Daugherty created, filmed and edited the winning video. Schools from all across the region participated, including South Fayette High School which won Judge’s Choice first place award. Forest Hills High School won second and Fox Chapel High School won third. Freeport Area High School won first place in the People’s Choice category and Pittsburgh Taylor Allerdice High School won third place. Watch the winning entries here.